The gym is for the body - Bridge is for the mind. 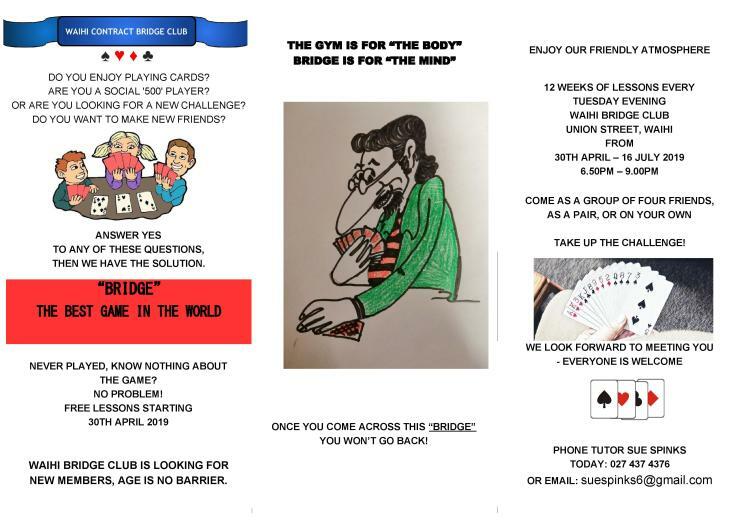 You're welcome to take up the offer of free Bridge lessons every Tuesday evening at Waihi Bridge Club, Union Street from the 30th of April. Learning is fun, be prepared to make new friends, and remember, age is no barrier. Bridge is the best game in the world, according to its devotees. It doesn't matter if you've never played before - the free lessons start on the 30th of April. Just email tutor Sue Spinks at [email protected] or phone 027 437 4376.